Whether you are tourist in the Pink City, or a Jaipur local looking for everyday commuting needs, Tixilo cab rentals services in Jaipur make sure of providing an excellent Jaipur car hire experience to all its customers. Since you, our customer are our priority, we make sure that your journey in the city is very safe and comfortable and also worth remembering. 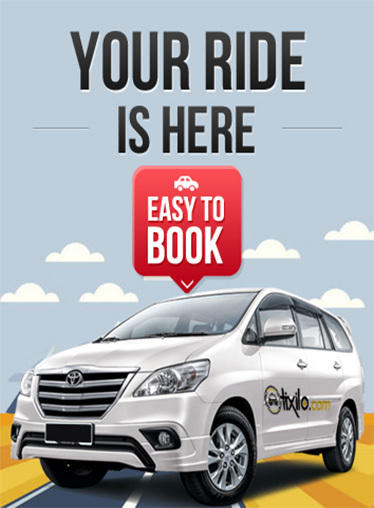 Why to choose a Tixilo cab in Jaipur? Jaipur is one of the famous tourist destinations in Rajasthan, and Tixilo cab rentals make travelling in the city very convenient. You can easily book a cab online, from amongst the fleet of cars including Sedans and SUVs and we make sure that your taxi is right at your doorstep on the specified pick up time. You can also choose us for our local services and shop around ethnic markets, busy bazaars and exclusive boutiques, or visit your local dentist or meet a friend. We ensure of providing you a comfortable and hassle free journey in the city. We will confirm your booking through an email and mobile SMS ensuring you of getting your ride right on time, without any wait. You can rely on our online cab booking services for making your one way trip from Jaipur to Delhi comfortable and enjoyable as well. the best route to reach Delhi is the one from Jaipur-Chandwaji- Kotputli- Neemrana-Gurgaon-Delhi, which is a 274 km long distance and takes a duration of around 5-6 hrs. Our experienced driver is well familiar with the places and therefore ensures of a smooth and hassle free ride. Moreover he will take you to the best place for eating on the way. Well-maintained and regularly serviced vehicles. Mobile app for fast bookings. Excellent Network of Car Rental Partners.